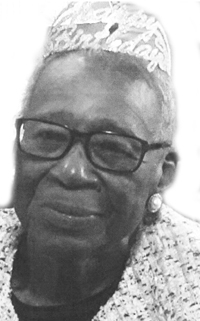 Augustus Funeral Home regrets to announce the passing of Mrs. Frances Viola Bristol. A Home Going service for Mrs. Frances Viola Bristol, wife of the late Maurice Bristol, loving and cherished mother of Eleanor Crockwell, Marcille [Snookie] Lewis and the late Millicent [Nippy] Williams, sister of Beatrice [Betty] Matthew, the late Katherine [Kate] Desilva, Alice Hansey, Helen Anderson and brother James Dill, in her 99th year of Farm View Lane, #10 Cedar Hill, Warwick, will be held at St. Mary The Virgin Anglican Church, 5 Middle Road Warwick at 2:00 pm October 5, 2018. Interment will follow the service at St. Mary The Virgin Anglican Church, Cemetery. Visitation: Salvation Army Cedar Hill Citadel Today, October 5, 2018 from 1:00 p.m.- 1:45 p.m.
She also leaves to cherish her memory grandchildren; Derrick, Allan [Shirle], Sylvian and Maureen Crockwell, Donna Leverock-Grant [Leonard], Terence Simons, Dawn Leverock, Troy Crockwell, , Sherleta Joyiens, Kimberley [Nikki] Williams and Isaiah ‘Bopsy’ Ejiikeme, a host of great grandchildren and great great grandchildren; brother-in-law: Earl Anderson; nieces and nephews: James [Peggy], and Earlston DeSilva, Raymond [Faye], Albert Lloyd , Quinton Matthews, Gwendolyn [Pie] Bean, Alfred Wilson [Toinette], Valeta Simons, Valeria Tucker and Derrick Simons; Godson Christopher Williams, special friend: Kate Darrell; Adopted son and daughter; Bruce and Glenna Andrews special caregivers: Verona Outerbridge, Sharon Symonds, Kim Vincent, Debra Burgess, Shamel Bascome, Members of Cobbs’s Hill Methodist and Cedar Salvation Army, and many other family and friends too numerous to name. She is predeceased by grandchild, Tamel Simons and niece Alfreda Pitt.